Defending NBA champions the Cleveland Cavaliers gave their fans a chuckle-worthy surprise before their game against the Miami Heat on Friday night. 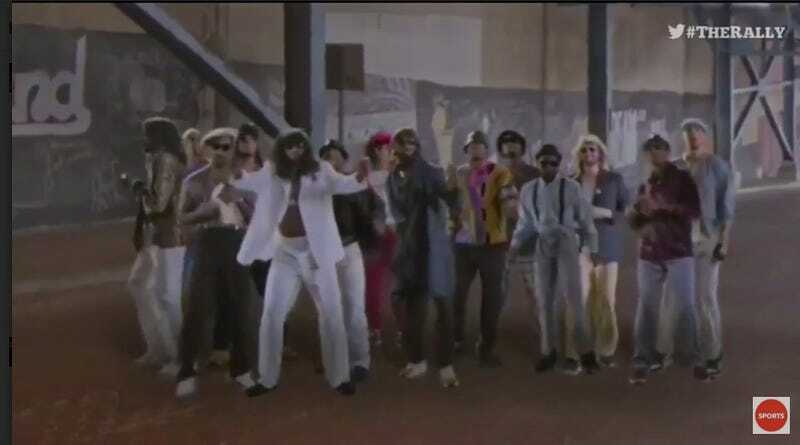 It was ’80s night in the Quicken Loans Arena, and before the LeBron James-led squad hit the floor, they changed up their introduction video with a slickly produced film—one featuring James, Kyrie Irving, Channing Frye, Iman Shumpert, J.R. Smith, Kevin Love, Chris “Birdman” Andersen—the whole crew, replete with men in shags, mullets and big ’80s hair. For those not in the know, “rickrolling” is a prank involving an unexpected appearance of the music video for the 1987 Rick Astley song “Never Gonna Give You Up.” Usually someone clicks on a disguised link, and instead of that, the the music video pops up. When this happens, you’ve been rickrolled!